They have Moses and the prophets; let them hear them. – Luke 16:29. 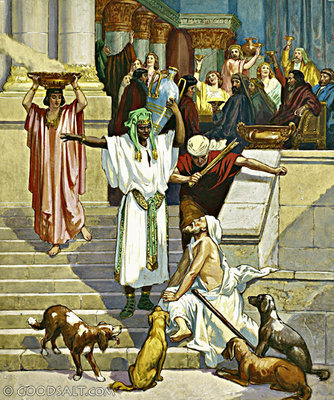 There was a certain rich man who was clothed in purple and fine linen, and fared sumptuously every day; and a certain beggar named Lazarus was laid at his gate, full of sores, and desiring to be fed with the crumbs which fell from the rich man’s table; moreover, the dogs came and licked his sores. And it came to pass that the beggar died, and was carried by the angels into Abraham’s bosom. And the rich man also died, and was buried. And in hell he lifted up his eyes, being in torments, and saw Abraham afar off, and Lazarus in his bosom. And he cried and said: “Father Abraham, have mercy on me, and send Lazarus that he may dip the tip of his finger in water and cool my tongue; for I am tormented in this flame.” But Abraham said: “Son, remember that thou in thy lifetime receivedst thy good things, and likewise Lazarus evil things, but now he is comforted, and thou art tormented. And besides all this, between us and you there is a great gulf fixed, so that they who would pass from hence to you cannot; neither can they pass to us that would come from thence.” Then he said: “I pray thee therefore, father, that thou wouldest send him to my father’s house; for I have five brethren, that he may testify unto them, lest they also come to this place of torment.” Abraham saith unto him: “They have Moses and the prophets; let them hear them.” And he said: “Nay, father Abraham; but if one went unto them from the dead, they will repent.” And he said unto him: “If they hear not Moses and the prophets, neither will they be persuaded though one rose from the dead” (Luke 16:19-31). We sinners must receive Christ Jesus by faith while we live; then shall we obtain salvation by God’s grace alone when we die. All who die in their stubborn rejection of Christ will be damned. To the end that sinners be brought to saving faith in Jesus, the Holy Ghost operates upon and changes the hearts of men through the Gospel. Other means of conversion God does not give. Nothing else could convert us—not even the witnessing of a miracle such as a dead man being restored to life. This is most certainly true. PRAYER. – God, who hath given to me the Word of Jesus, have mercy upon me, and grant that I may properly use this Word with a glad heart. Through the power of the Gospel, strengthen and preserve my faith in the Savior in order that I may not be lost, but obtain eternal bliss with all the elect. Help me, help me, O my Lord! Amen. And loved their earthly treasures!